Chains. They can be used on tires and fences, to lock doors — and to work out! Yep, chains can be used as a form of variable resistance training that can develop your body in so many beneficial ways. Resistance in any form — chains, dumbbells, barbells, kettlebells, etc. — have numerous physical benefits. These include muscle tone, cognitive ability, preventing and fighting disease and greater stamina. 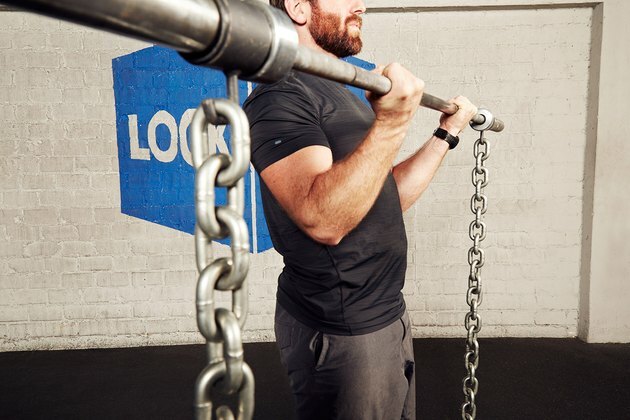 Need more proof you should add chains to your workout? Here are four reasons to put some extra heat in your fitness regimen with chains. 1. Chains require increasing strength to lift. To put it scientifically, “chains have a linear mass-displacement (i.e., length-load) relationship.” Simply put, it means that the higher the chain is lifted, the more weight you’re lifting. Chains get heavier link by link as they’re lifted off the floor. That means you need to recruit more and more muscle fibers throughout your lift. And who doesn’t want to get stronger faster? 2. Chains activate your stabilizer muscles. If you’ve ever looked at a hanging chain, you already know it sways and twists when it’s lifted. So when doing barbell exercises, this affects both the bar and body. It forces your core and stabilizer muscles to engage even more to help build stability in the muscle groups being used. 3. Chains have both concentric and eccentric benefits. With squats, bench presses and deadlifts, the primary benefit is coming from adding weight as you lift (the concentric phase). But the other way this can benefit you is on the way down (the eccentric phase). At the top, you’ve generated so much force and tension that it’ll be harder to control the bar down as you start to descend. Since the weight is constantly changing, you’ll need strength and focus to lower the bar with control rather than dropping the bar at an unsafe pace. Zercher squats are the unsung hero of the squat world and a great lift that only gets better when adding chains. The benefits of Zercher squats include strengthening the core, glutes, quads, hamstrings, biceps and back. HOW DO TO IT: Set up a barbell with chains hung on each side. Hold the bar at navel height, securing it in your elbow creases with your fists up toward the chest. Set your feet shoulder-width apart with your toes slightly angled out. Hinge your hips and move back and down, knees driving apart and chest remaining upright. Once your hips go below knee level, drive through your heels to stand back up. The squat jump is a fiery beast. Add some heavy chains around your neck like a necklace and get ready for some explosive output. Just make sure you’ve mastered regular jump squats and that your knees and hips are injury-free. HOW DO TO IT: Stand with your feet shoulder-width apart and your toes slightly angled out. Descend into a squat, hips moving back and down. Then fire into full hip extension, jumping into the air. Absorb the weight back into a full squat (or at least with knees slightly bent). Don’t jar your knees with a stiff-leg landing. Single-leg Romanian deadlifts are great for the hamstrings and stability through the kinetic chain down your leg. So let’s add some chains. HOW TO DO IT: Hold a chain in each hand and stand with your feet hip-distance apart. Pinch your shoulders together. Start by raising one straight leg back with your toes facing the floor. Start to tilt forward, maintaining a straight line from shoulder to heel. Let the stabilizing knee bend slightly as the torso and leg hit horizontal. Then drive through the heel to stand back up. Pull-ups are a great body-weight exercise for the upper body and core. And if regular ones aren’t enough of a challenge for you anymore, try them with chains. HOW TO DO IT: Take a chain and drape it around your neck so the links fall down your chest on either side of your neck. Set your grip on the pull-up bar with palms facing away from your face. Pull your chin above the bar. Control yourself as you slowly lower back down to fully extended arms. Sure, you can pull pretty much any weight with a battle rope, but as discussed above, chains add some serious resistance. In this case, it’s not only because of their extra weight, but also because of the added friction with the ground. HOW TO DO IT: Take any rope (or battle rope, if you have it) and tie on a heavy chain at one end. Pull the chains toward you, hand over hand, for a great biceps, back, core and full-body burner. Let’s take a bodybuilding classic and give it a little spice. HOW TO DO IT: Grab a barbell and set it up at about waist height on a rack. Loop chains on either side of the barbell and hold it at hip height. Then raise the bar up to your shoulders. To add an extra burn, slow down the rate at which you lower the barbell back to hip level. Have you ever worked out with chains before? Does your gym or CrossFit box have chains? Do you think you’ll add them into your routine now? Which of these exercises do you want to try? Are there other exercises you do with chains? Share your suggestions and questions in the comments below! Performance Enhancement in the Terminal Phases of Rehabilitation. Resistance training is medicine: effects of strength training on health.